TECHNIQUES & MECHANICS USA VOLLEYBALL ( Rule 1 ) ~ To deepen our knowledge in a volleyball game would be nice if we know the rule that must be adhered to in the conduct competencies volleyball. 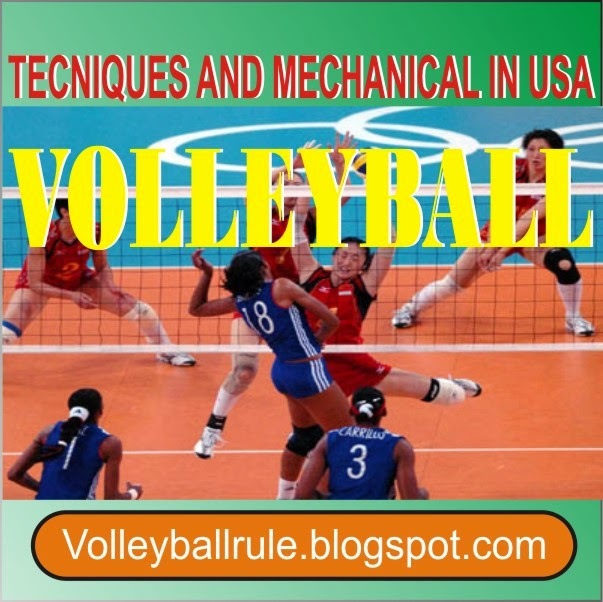 Know more about the rules of the game of volleyball, before choosing to become a professional volleyball player, you need to know how the rules and mechanics of the rules volleyball in USA. If the fault is whistled by the first referee, the first referee indicates which team wins the rally by extending the arm in the direction of the team that will serve (palm perpendicular to floor), then the nature of the fault and the player at fault if necessary. All signals are repeated by the second referee (except net serve and service beckon). If the fault is whistled by the second referee, the second referee will indicate the nature of the fault and the player at fault if necessary. The first referee then indicates which team scores and serves next and the second referee repeats that signal. The first referee does not signal the fault or player at fault. When the second referee’s whistle ends a rally, s/he should step to the offending team’s side of the net and signal the fault. When the first referee’s whistle ends the rally, it is recommended (but not required) that the second referee steps to the offending team’s side of the net to repeat the signals of the first referee. Completely extend the arm straight up, hand open, on the offending team’s side, and make a downward motion over the net, palm down. Indicate the player at fault if necessary by pointing with an open hand. Completely extend both arms straight up from the shoulders (elbows are not bent), palms facing away from the body. Traditionally indicated by holding both hands in front of body at head height, palms toward first referee, making eye contact with the first referee.